Common Core Standards met in this lesson: W.9-10.4, RL/RI.7, W.9-10.2 (see details below). Explain what the title “More Than One Story” means and why that meaning is important. Analyze artwork created by Ghulam Mohammed, this year’s Jameel Prize winner. Create your own art work and explain how different works of art create different meanings and different feelings. 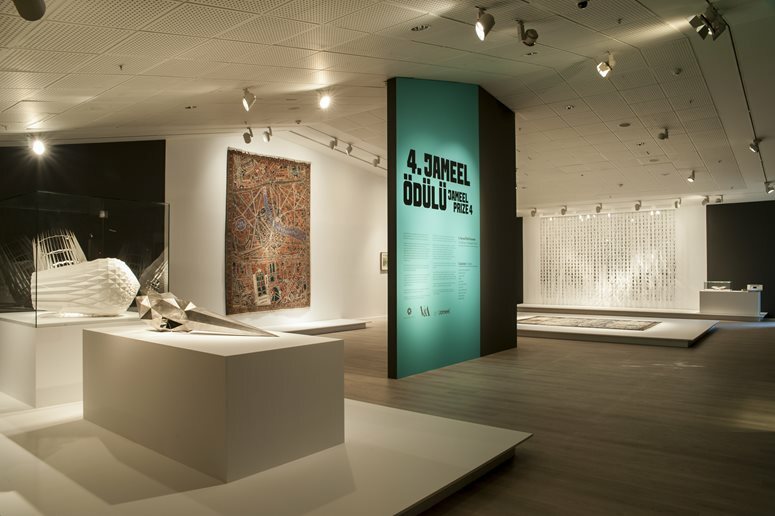 The Jameel Prize 4 exhibit, above, showed 11 finalist works in addition to the five winning works by Ghulam Mohammed. Read “More Than One Story,” being sure to pay attention to the headline, the subhead and the bolded paragraph that introduces the article. When you’ve read the whole article, answer these questions either in writing or in discussion with your classmates: What does the headline refer to? How is it related to the Jameel Prize for Contemporary Art? Keep in mind that the headline may refer to more than just the bolded introduction; it may refer to the Jameel Prize, too. Left: "Untitled," by Ghulam Mohammed, Collage on wasli paper, 9 x 14 cm. Right: "Untitled," by Ghulam Mohammed, Collage on wasli paper, 9 x 14 cm. This year’s Jameel Prize winner is Ghulam Mohammed. Look at his two pieces of his work that are pictured above. Use the following questions to guide you in analyzing them. What do you notice first about the pieces? What do you like about them? What do you not like? How would you describe the art to someone you were telling about the article in Aramco World? Find the place in the article that describes Ghulam Mohammed’s art. Underline or highlight it. What, if anything, do you see in the finished pieces that would lead you to know what the works are made of? Does knowing how the pictures are made change what you think of them? If so, in what way? Now that you know how the pictures were made, think about why they were made that way. Continue your analysis by answering these additional questions. 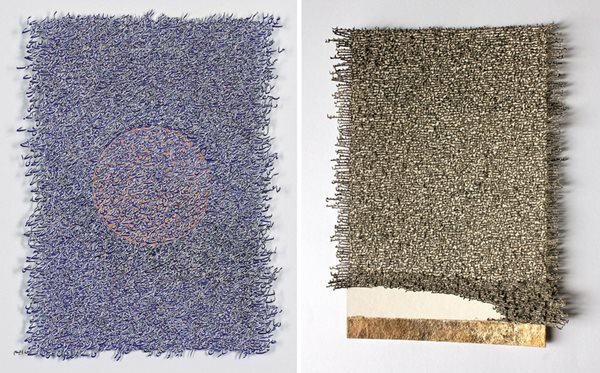 Why do you think the artist chose to cut up Urdu texts and use the letters to create his work? What does knowing what the art is made of mean to you when you view the art and want to understand it? Another way to analyze and understand art is to try making your own. Try a modified version of Gulam Mohammed’s method. Start by choosing a document that you will cut up to make a picture. What document do you choose? Why is it significant to you? For example, is it a document you particularly like, or maybe one you want to cut up because you don’t like it? Make a photocopy of the document. (For the purposes of this activity, you don’t need to cut up an original!) You might decide to copy the document at its actual size, or you might decide that you don’t want to work in miniature as Mohammed did, and make the document larger. Cut out letters from the document. (Most likely you will need to use a razor blade or another tool that allow for the delicate cuts you need in order to cut out individual letters.) Then paste the letters onto a sheet of paper. You don’t need to make your own paper, but think about what kind of paper you want to use—thick or sheer? a neutral color or something more noticeable? As you make each decision, pay attention to what you’re thinking and how you’re feeling about your choices. “More Than One Story” says that Ghulam Mohammed embellished his work with gold and silver leaf. You don’t have to do that (unless you happen to have some gold or silver leaf!) but think about whether you want to embellish your work. If so, what do you want to use? Why? What effect do you want to create? What does it mean to you? You might, for example, decide to use crayons, because your letters come from a book that was a favorite of yours when you were younger, and because crayons were what you used then. When you’ve finished your piece, write a paragraph explaining your creative choices, what you were trying to create and what the art work means. Display your work alongside the work of your classmates, and view each other’s pieces. Notice the ways they are like yours. And pay particular attention to the ways they are different from yours—because despite the fact that you all followed the same instructions, each artist interpreted those instructions differently and each piece meant something different to its creator. W.9-10.4 Produce clear and coherent writing in which the development, organization, and style are appropriate to task, purpose and audience. RL/RI.7 Integrate and evaluate content presented in diverse media and formats, including visually and quantitatively, as well as in words.